It's no longer radical to keep your name, merge your SO's name with a hyphen, or invent a new surname as a couple, but what is still radical is giving a child a woman's surname (especially when the parents are married). What happened when Molly Caro May gave it a try is pretty telling. It's certainly not a common practice. Only about 18% of women keep their surname upon marrying as it is (2009 research). That is down from the previous 23% at peak trend in the late '90s. 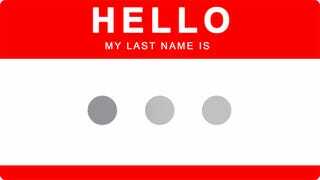 A more recent look in 2010 discovered that older women (35 to 39) are over six times more likely to keep their names. But whether the parents in question were married or not, a BabyCenter survey found that only 4% of children were given the woman's surname. There are a lot of practical reasons you would find yourself in that small percentage: If the mother is not marrying the father of the child and is raising the child alone, she may wish to give the child her surname. In a family quoted in the above link where the mother was Korean and the father was Caucasian, the couple chose to give the child the mother's Korean name to preserve heritage. But within a married couple wherein the woman keeps her name, embracing all these potential snares and giving a child the woman's surname can be an intentional way of shaking up convention. That is the case for Molly Caro May, who, in an essay at The Hairpin, muses on what happened when she and her husband, Chris, went for it simply because they wanted to. And given that their friends and families had always been open-minded, she writes, they were not prepared for the shockwave. First, she says, her younger brother asked how Chris felt being emasculated. Then her mother warned of future trouble on the playground. Someone else accused her of doing it to "make a point." Another said she risked "the ease of preserving lineage and historical records." Everyone has to defend the decision they make about it. Over and over again, I watched women acquaintances hear me mention it and then, almost immediately, the mask of self-protection would slide over their faces. They probably saw me as a better-than-thou type. I tried hard not to be that. I didn't want to shame anyone. I only told people when I was asked and purposely acted casual about it. Some of my married women friends said nothing; some smiled big smiles; my single friends told me either they were taking notes or they could never possibly. Men often looked unsure but pretended to be hip to it. One guy friend teased, "Of course you would." Many people are coming up with new brave options: blended last names, siblings with different last names, hyphens. But when a couple decides to use both names as a last name, usually the woman's last name gets tucked between her child's and husband's, and usually that's the one that falls away around school age. Very rarely is the man tucked away. How come? It makes me uncomfortable to even ask, because it sounds accusatory of anyone or, especially, the people I dearly love who lined it up like so. I don't mean it like this. We all contend with this history together. I'm starting to think that queer couples with children will lead the way. They'll demonstrate how non-gendered a last name choice can be. In my anecdotal experience, single mothers raising children alone still give their child the father's surname, perhaps in the hopes of one day getting benefits or assistance from him, even if he is never truly involved. In couples that marry where the woman keeps her surname, the resulting child still carries the father's name. I'm not judging — I took my husband's surname upon marriage and gave it to our child for personal reasons. It was uneven, but it had been uneven the other way for millennia (though matriarchal societies did exist once upon a time) and sometimes the pendulum has to swing wildly before it can even out. I would never advocate for all children having their mother's last names. But imagine if 50% them did. Imagine the social impact on our collective unconscious. It would be a movement requiring no money, no lobbying, no elbow grease. It's a choice anyone of any background can make—harder for some, I know. And our naming system would actually be diverse. No one gender would occupy it. Like interracial marriage, hyphenated last names, gay adoption, boys with long hair, over time, people will get over the shock of the new. And over time, May's family did, too. She reports that the latest response to the news of the surname tends to be what a great guy her husband is for "letting" her do this. And her essay illuminates how complex and freighted the issue is. Ultimately, the act of naming a child after yourself as a woman is an act of preserving your own name. But that name is probably your father's name. In the end, what May asks is that we have a conversation about naming conventions rather than a given, assumed choice. More choice in this arena is good, because even though on some level, all families blend in one way or another to become one, what makes a family a family has so little to do with names anyway.